When you're both a curious avocational historian and an early-stage birder, you tend to end up in places that might not seem useful to either interest. That's not such a bad thing. The basic premise is that you don't know what you don't know. If you're not sure a location is historic, or if the habitat might be a little off, you can't automatically discount it for being barren of a good story or a good bird. If you take a look around and keep an open mind, you might be rewarded with a real treat. That was my rationale for a recent visit to Bayonne. From a geographic perspective, it looks great: located at the southern tip of the peninsula separating Newark Bay from the lower Hudson River, the city's borders are mostly shoreline. However, this advantage, combined with proximity to New York and Newark, made it the perfect place for industry. Starting with the construction of the city's first oil refinery in 1875, Bayonne became heavily industrialized, resulting in a gritty image and negative environmental implications. So much for the birds, right? Not so fast. From the Meadowlands to Linden, we've seen some incredible wildlife in areas that are bouncing back from years of neglect or abuse. As for Bayonne, local birders have reported interesting species in and around the waterfront parks, so I decided to take a look. A quick check of the map showed a nice bit of marshy open space right on the bay, accessible directly from Route 440. Granted, you can't expect much from visiting a marsh in the midst of an extended period of sub-freezing weather -- it's highly unlikely you'll find anything but ice -- but I figured the bay might reveal some interesting ducks. And who knows? I might run into a few historical markers along the way. After navigating the heavy truck traffic of US 1 and 9 and then 440, I made the quick turn into a small parking lot for Rutkowski Park. As promised, it's on the waterfront, easily accessible by car if you have good reflexes and no 18-wheelers are barreling down your neck. The only other vehicle in the parking lot was a utility van. The park itself seems rather unassuming from the highway approach -- a somewhat hilly field with paved paths -- one headed toward the water's edge and another headed straight back to the marsh. Walking along the bay, I soon found the men responsible for the van, braving the chill with rod and reel despite signs warning the dangers of eating locally-caught crabs. A little farther along, I saw a few mallards and buffleheads drifting not far from shore. Turnpike extension in the background. As I continued my stroll, a strange yellow contraption came into view, looking way too well-maintained to be something the park's designers left because they couldn't move it. A detailed historical plaque dismissed all doubt: this thing wasn't just there intentionally, it had been moved from another waterfront location in Bayonne specifically because of its significance. This contraption was a crane which once stood within the boatyard of the Electric Launch Company, better known as Elco. Now replaced by the Boatworks condo development, Elco operated at its Avenue A and 8th Street location from 1892 to 1949. The company's roots were in pleasure and utility craft, building electric-powered boats (equipped with Edison storage batteries, if my research proves correct) for clients including Charles Lindbergh and Henry Ford. However, its real claim to fame was as a defense contractor, constructing fast boats for the United States and its allies during both World Wars. Specifically, Elco built the 80-foot Patrol Torpedo (PT) boat, the primary motor torpedo boats used by the Navy during World War II. 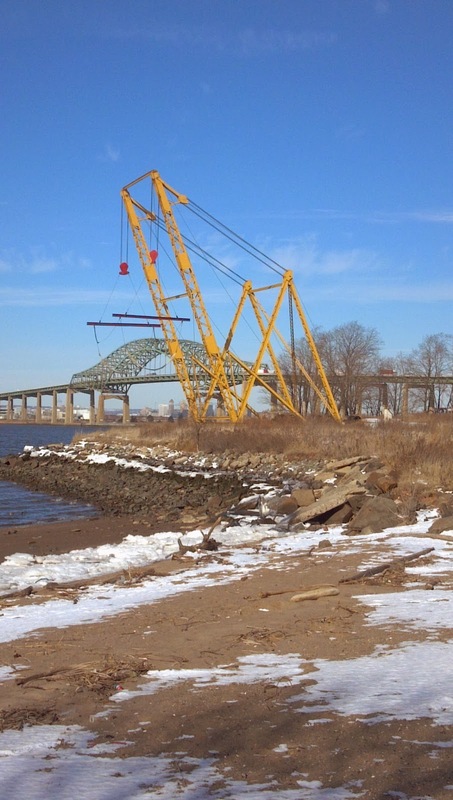 The men and women of Elco built 170 PTs at Bayonne, and the crane at Rutkowski Park once lowered the newly completed vessels into Newark Bay. Known as mosquito boats for their ability to reach a target almost silently, the wooden-hulled, gas powered PT boats carried crews of 12 to 14 men and performed multiple duties, from laying mines to rescuing stranded aviators. Some even participated in the D-Day invasion at Normandy. The most famous of the Bayonne alumni was PT-109, which, under the command of Lt. (j.g.) and future present John Kennedy, was rammed and sunk by a Japanese destroyer in August 1943. Unfortunately, Bayonne's Elco crane is likely one of the few large and authentic relics of the PT. Only one of the boats still exists, according to the U.S. Navy's Naval History and Heritage Command, the rest having been disposed of shortly after V-J Day. Elco itself merged with Electric Boat of Groton, Connecticut in 1949 to form General Dynamics; entrepreneurs revived the Elco name in 1983 to manufacture electric boat motors and pleasure craft in Athens, New York. As for the rest of Rutkowski Park, I've vowed to return once the weather warms and the marsh thaws a bit. Having found some unexpected history, I can't wait to see what might be lurking in the tall grass along the boardwalk. Many thanks to Jodi Jameson of Hackensack Riverkeeper for the heads up on Rutkowski Park! The southernmost reaches of the Garden State Parkway are among the most picturesque, winding through acres of pinelands and affording broad views of coastal marshland. Only the width of two lanes in each direction, the north- and south-bound lanes are separated at points by buffers of trees and even a pond. With a little effort, you can imagine the ride as a drive through bucolic New Jersey. As nice as that is, scenery wasn't the only rationale for dividing the highway. One tall, very old reason stands in the John B. Townsend Shoemaker Holly Picnic Area in the center median at milepost 22.7. Stop there, park in the northern end of the lot, and you'll easily find the tree that rerouted the Garden State Parkway. You'll be excused if you haven't noticed it before. Despite many trips through the area, I only discovered it when researching our recent story on the holly forest at Sandy Hook. There's a tiny mention of it on the smallish brown signs marking the picnic area but that's easy to miss if you're passing at highway speed. The Shoemaker Holly has stood for more than 300 years, making it the oldest tree of its kind in New Jersey and perhaps the nation. The Shoemaker family may have been aware of its existence before they sold their property to the Highway Authority for the construction of the Parkway, but it only became widely known in the early 1950s, when the of the final stretch of the highway was set to be built. The holly was directly in the planned path of the road, certain to be sacrificed in the name of progress. Live long and prosper, Holly! 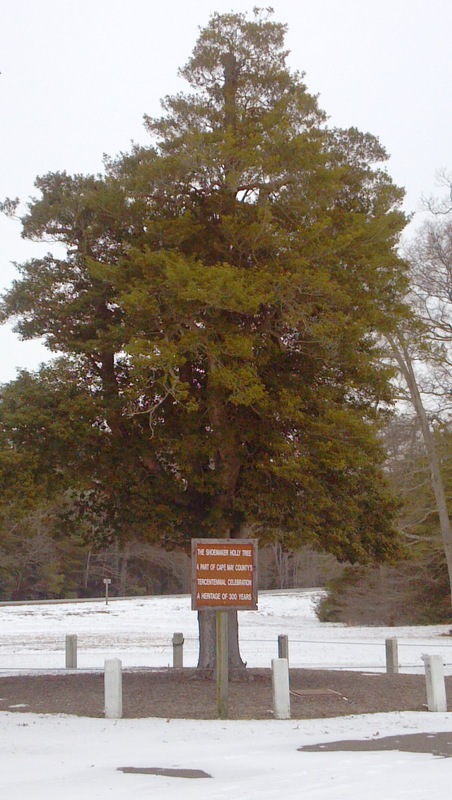 According to the New Jersey Division of Parks and Forestry, Millville resident and Holly Society of America founder Daniel G. Fenton led the charge to save the tree. Considering that the root of the parkway concept is to provide just that -- a park way -- preserving the Shoemaker Holly must have seemed like a natural to the Highway Authority's chief landscape architect, Gilmore Clarke. He worked with road planners to incorporate the holly into the overall design, creating a 120 yard wide island of green between north and south lanes. The holly itself is cordoned off with its own name sign and a brass plaque noting its significance in Parkway history. The picnic area provides a pleasant stopping point for travelers, with an attractive wooded area, park furniture for a casual outdoor meal, and a rest room. Outside of beach season, visitors might forget they're, in essence, playing in traffic. If you need to stop to stretch your legs or walk the dog, there are a lot worse places to do it. We stopped to visit the holly on a recent frigid day and were impressed by its 60 foot height and broad girth. 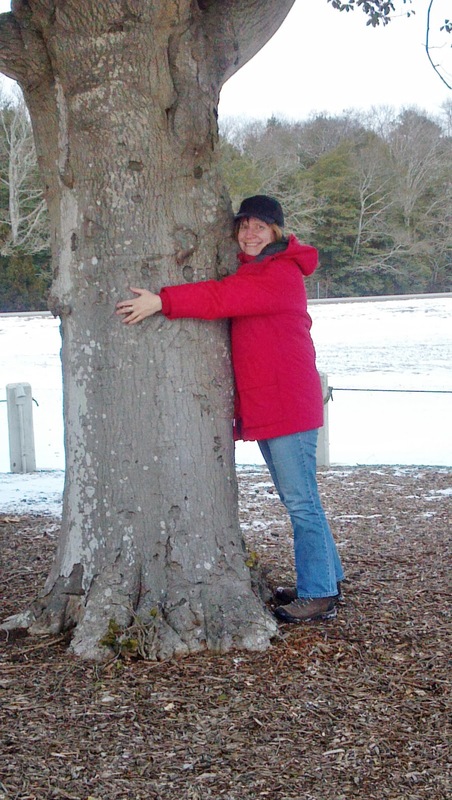 From a good hug, I'd say that the trunk is about eight feet in circumference, far broader than any of the hollies we've seen at Sandy Hook. He (we didn't see berries so we assume it's not female) appears to have been pruned judiciously over the years, and according to an article in the Lower Township Gazette, Parkway arborists have been providing the necessary maintenance to keep the tree healthy. That said, its advancing age has supporters somewhat concerned, as hollies generally deteriorate after about 300 years. To further preserve the Shoemaker, the Parkway has stopped the long-time custom of festooning it with lights during the Christmas season. The Shoemaker Holly was flooded in light every night of New Jersey's 300th anniversary celebration, but I've heard no similar plans for this year's 350th. Still, though, it wouldn't hurt to drop by and give 'em a little love. At the very least, take a break from your Cape May trip to admire one of New Jersey's oldest and most durable citizens. When inclement weather forces us Hidden New Jerseyans to curtail travel, we often turn to other means of exploration. The reference books and histories we've picked up over the years aren't quite those roadside markers we stop to check out on county roads, but they've got some unexpected gems, nonetheless. One of my new favorites is the New Jersey Almanac Tercentenary Edition published by the Trenton Evening Times in 1964 to commemorate the state's 300th anniversary. Besides giving an illuminating look at life in the Garden State 50 years ago, it contains lists upon lists of interesting tidbits like two-sentence bios of notable New Jerseyans, brief descriptions of towns and cities, and a year-by-year guide to events of importance. It's an entry in that last category that caught my eye during a recent snowstorm. The big event for the year 1794 is: "Nicholas Roosevelt made first steam engine ever built entirely in America at his shop "Soho" in Belleville." Roosevelt? As in Teddy Roosevelt and FDR? The New York Roosevelts? Absolutely. Nicholas Roosevelt was not only the cousin (several generations back) of both Presidents Roosevelt, you could say he was one of New Jersey's first industrialists. Born in New York in 1767, Roosevelt's first foray into New Jersey was in the early 1790s, when he became linked to what, even then, was thought of as the old Schuyler Mine in North Arlington. Originating in 1719 when an enslaved worker on Arent Schuyler's farm found a copper nugget on the property, the mine closed in 1772 after a disastrous fire. Roosevelt and partners formed the New Jersey Copper Mine Association in 1793 to restart mining operations at the site, a venture that ultimately failed. Though the mine was a disappointment, it was the stepping stone into New Jersey that led to Roosevelt's greater acclaim. Purchasing land in Second River (now Belleville), he built a foundry, smelter and machine shop to build steam engines. Dubbed Soho after a similar enterprise in Birmingham, England, the shop became known as one of the nation's top foundries, supplying engines for notable clients like the Philadelphia Waterworks. The business took a severe financial hit, however, when a government contract to supply rolled copper for warships was cancelled. Among those taking note of the quality of Soho's engines was transportation engineer John Stevens. Already experimenting with steam-driven boats, he and his partner Robert Livingston commissioned Soho in 1797 to build an engine for the Polacca, a craft with a stern-mounted propeller. Roosevelt was already familiar with self-propelled boats, having experimented with spring-driven paddleboat technology as a youth. When the Polacca proved to be much slower than anticipated, Roosevelt advocated the use of a side-mounted wheel, but Livingston refused to consider the concept. Roosevelt had, indeed, come up with a solution so workable that it was later adopted by Robert Fulton. You might recognize that name: he's the engineer who's usually linked most directly with the successful development of the steamboat. I've seen a few different accounts of how this came to be, but the most interesting one is that Livingston suggested the side-mounted wheel to Fulton without telling him where the idea had originated. And according to a website citing sources at the FDR Library and Museum, some Roosevelt family members continue to claim that Nicholas was the true inventor of the steamboat. It's not clear exactly when Roosevelt left New Jersey for good, but by 1810 he'd entered into a partnership with Fulton and Livingston to run a steamboat down the Mississippi River. He died in Skaneateles, NY in 1854, his contributions to steam powered technology now largely forgotten while other inventors continue to enjoy acclaim. I just wonder what other gems are hiding in the Tercentenary Almanac, just waiting to be unearthed. Our recent report on duck spotting at Barnegat Light indicated that winter birding is not for the faint of heart. Persistent (and well-insulated) explorers should discover, though, that hanging around in the cold and wind (and even snow) can have its reward in the sighting of species that reliably return to certain spots, year after year. Take, for example, the Short-eared owl. Habitues of open grasslands, some of these moderate sized raptors spend their winters at the Wallkill River National Wildlife Refuge in Sussex County. A viewing deck at the state border with New York provides a good spot to gather with other hearty souls late on a January afternoon, waiting for the sun to drop below the surrounding hills so the show can begin. My first visit to Wallkill a few years ago set an unrealistic expectation of the relative difficulty of spotting owls. Ivan took me to see the owls just after we'd met, telling me that the odds were good that we'd see at least one in the field, and I came away thinking that either it was pretty easy, or he was some sort of bird conjurer. Basically, we drove up, he set up a viewing scope on the platform, and within 10 minutes, he found the owl in question perched on a slim stump about 50 yards away. He invited me to take a look, and not only was the bird there, but as if on cue, it turned to look directly at me. If I didn't know better, I'd have thought Ivan had stopped by earlier to plant a mechanical decoy in the field. Most of the time, spotting the birds isn't as easy as that. It takes time, patience and a touch of fortitude. Time and patience: like most members of its taxonomic family, the short-eared owl hunts largely in darkness. The key is to get to the appropriate viewing site just before dusk, wait and hope they decide to show. Fortitude: well, try standing in an open grassland field at dusk in January. It's windy, and you're often left to stand on snow pack whose chill permeates the thickest of boot soles. Before long, no matter how many layers you're already wearing, you start regretting not having the forethought for electric socks and that extra set of thermal underwear. This time around, it was plenty cold, but the inevitable wait was tempered by the pre-game show. A sole adult Bald eagle scared up a massive flock of grounded Canada geese in the field across the road, the geese apparently not realizing that the chances of one eagle killing them all was rather remote. Not long afterward, the show started on our side of the road as a host of Northern harriers glided effortlessly above the tall grass. A little longer yet less bulky than the Short-eared owl, the harrier's face is somewhat disc-shaped like an owl's, though the two aren't related. Among the many brown females we witnessed skimming and diving around the field, a striking "gray ghost" male harrier flew around the territory like a mysterious spectre. As we stomped our feet to keep warm, local birders told us that during the week, when fewer people are there to observe, up to a dozen Short-eared owls were known to come out to hunt. 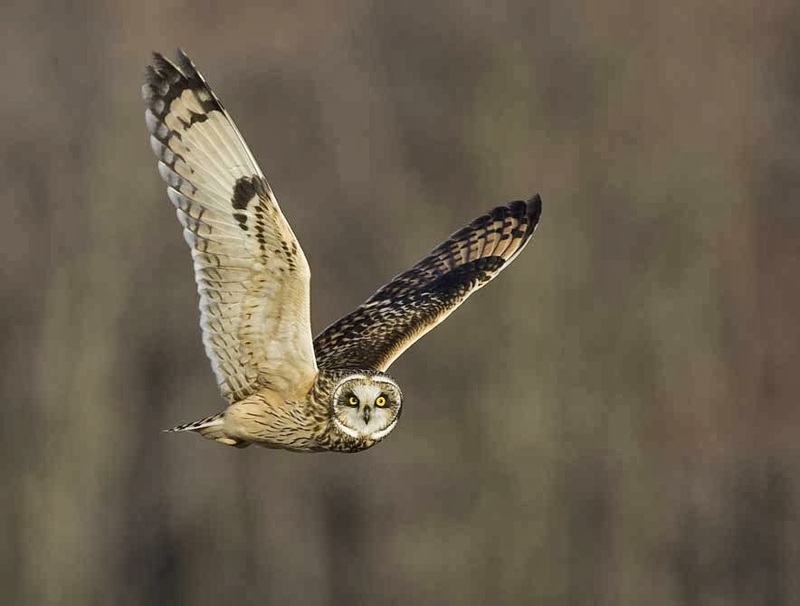 They had good reason, too: according to management at Wallkill, conditions over the summer resulted in what's described as a bumper crop of rodents, the prey of choice for owls and harriers alike. The evening we were there, they started a little later than their customary 4:45 flight time. Suddenly, as light was draining from the sky, we noticed other forms among the many harriers patrolling the field. The new visitors had stiffer wingbeats and bulkier wings. It took a few minutes, but I started to be able to differentiate the two types of birds from their flight patterns and relative size. I didn't get a firm count of owls, but it was clear that several had felt comfortable enough to fly within view of us humans. The show was definitely on! Chilled to the bone and satisfied we'd met our goal for the trip, we started toward the car to warm up, but one owl seemed not quite ready for us to leave. It approached, soaring higher as if to get a view of us from above, and maybe to confirm to us that we had, indeed, seen what we thought we'd seen. Even in the waning light, we could see its distinctive under-wing pattern as it flew directly overhead. With that parting adieu, we left, happy that our frigid vigil had paid off. Have you driven a Ford (on the beach) lately? Just about every numbered highway in New Jersey has at least one: a car dealership. They're so commonplace that they'd almost be invisible, except for the giant flags and inflatable thingies dancing in the breeze created by passing traffic. It's hard to believe that there was a time when there were no dealers at all: no lots filled with rows and rows of cars, no salespeople asking what they needed to do to get you into "that" car today. Originally, most if not all auto manufacturers sold their products through catalogs and print advertisements. Given its onetime status as America's Motor City, it's probably not surprising to discover that Detroit was the home of the first independent automobile showroom. 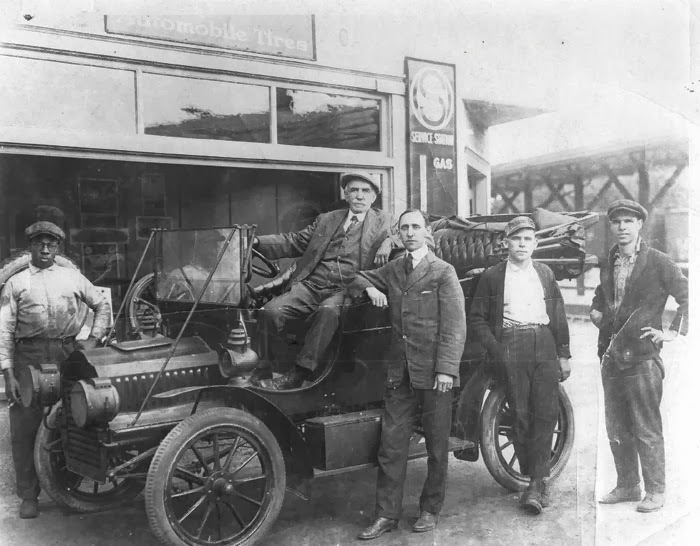 However, the very first Ford dealership wasn't in Michigan, but in the resort town of Cape May, its founding the unintentional consequence of an auto race. In the early days of the 20th century, manufacturers and hobbyists tested the latest and greatest cars on sand tracks and even on frozen lakes. The names of now-famous brands were participants, including Henry Ford and Louis Chevrolet, who drove their own races. Cape May's beach was lauded as an ideal spot for auto racing, prompted by the formation of the city's own automobile enthusiasts club in 1903. Two years later, more that 10,000 people flocked to the resort city for a weekend beach carnival that included three days of motor racing. All of the big names were expected to be there, including Chevrolet (driving a Fiat), Ford, professional racer Walter Christie and a host of others. According to the August 31, 1905 issue of The Motor World, Ford was delayed in reaching Cape May for the August 25 races, forcing him to drive his 60 horsepower car without benefit of making necessary tuneups. The auto magnate came in dead last in a field of four, with eyewitnesses later claiming that a sudden wave had overtaken his car, literally washing out his lead. Reports of the time say nothing of it, but legend has it that Ford was counting on winning the race so he could use the prize money to pay for his accommodations at the Stockton Inn. Lacking those funds, he offered the hotel manager stock in Ford Motor Company, which had gone public only a year earlier. No dice. Maybe the manager was skeptical about Ford's viability, or maybe he was simply risk averse, but he wanted cash. Ford then looked to the unquestionably valuable assets he had with him. Besides his race car, he'd brought a Model F sedan, which he offered to local resident Dan Focer for $400. To sweeten the deal, he promised to make Focer the first dealer of Ford vehicles. An engineer on the West Jersey Railroad, Focer agreed to the transaction and started selling cars in Cape May three years later, around the same time Ford began using the production line to manufacture cars. He later took on J.E. Mecray as a partner in the dealership. As for Ford, he left Cape May with his accounts settled. A few years later, he and a partner purchased land in the city, with the vision of building transatlantic shipping facilities to import cars to Europe. However, nothing became of the plan. Focer and Mecray reportedly went out of business in 1937, though the WPA Guide to 1930s New Jersey claims that the "First Ford Agency" on Washington Avenue was still displaying the car in 1938. Regardless, the vehicle hasn't been seen publicly in quite some time. It was last known to be with a now-defunct Ford dealership in Chester, PA.
Birders often find themselves taking a counter-intuitive approach to normal human instinct, at least in terms of where to hang out. Take, for instance, the shore. Most people would head to Long Beach Island in the summertime, when the warm sun and inviting waves beckon visitors from far and wide for relief from seasonal humidity. Conversely, virtually the only people you'll find on LBI's shores in the dead of winter are fishing enthusiasts and birders looking to spot and identify waterfowl. We humans may think it's too cold to be in the water, but for the ducks, loons and various shorebirds who spend their breeding seasons in the upper reaches of Canada, New Jersey may just as well be Florida. Some really colorful and fun waterfowl especially like the area just off the jetty at Barnegat Light, on the northern end of LBI. So much so, that it's a reliable spot to get one's annual look at a couple of species, most notably harlequin ducks. Ivan's been making a regular wintertime trip there; I've tagged along for the past few years, including this past Sunday. While they're pretty much guaranteed to be there in January, getting to the ducks takes some doing. If you've been to Barnegat Light State Park, you'll remember the concrete walkway that extends southeast of the lighthouse. To see the more interesting waterfowl, you'll need to walk to the end of that path, climb under the railing and continue along the bare rip-rap jetty. Navigating those boulders is somewhat like the old video game Frogger, but often with stiff gusts of wind wreaking havoc with your balance as you listen to the sea water rushing through the cracks as waves pound the rock. Part of the thrill is that there's always potential for a bonus beyond the harlequins. Last year, we'd been treated to a good view of a seal, as well as a surprising fly-by from a brown pelican. The not-knowing is a powerful motivator to keep stepping one's way farther down the jetty, carefully avoiding the crevices between the rocks. The harlequins didn't take long to find, their distinctive colors showing beautifully as they swam alongside the riprap. Then there was another duck I didn't quite recognize. Maybe I'd seen one before, but his large bill looked like some kind of funky road construction camouflage, with a splash of bright orange along with white and black markings. His body was mostly black, though it had white spots on its face and neck and orange legs to match its bill. "Surf scoter," Ivan observed, noting that we'd seen them through the viewing scope on another birding foray. Ah, that's it: while I'd gotten a distant look before, this one was so close I could study and enjoy every bit of that unique looking, colorful face. 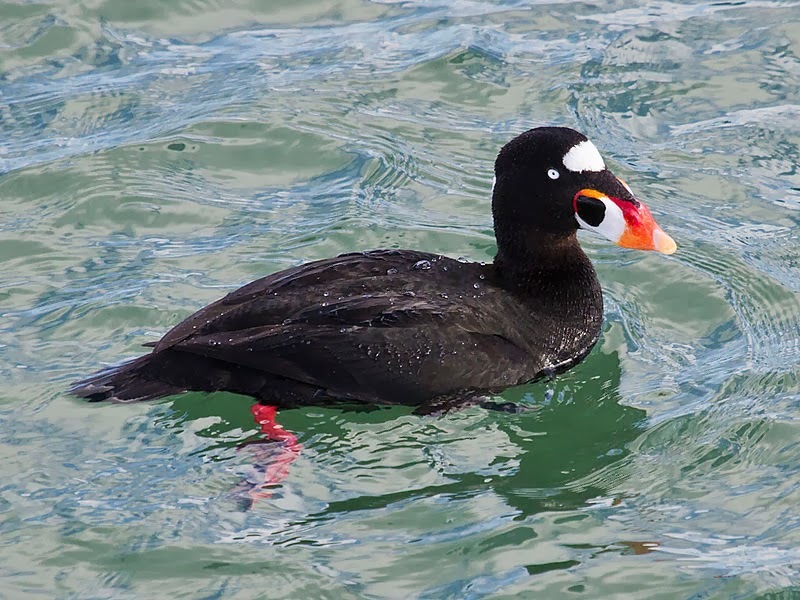 I soon noticed another similar bird, all black with an orange bill -- the black scoter. While Ivan made his way farther down the jetty to find purple sandpipers, I carefully sat down atop the rip rap to visit with my new avian friends a bit more, relishing an opportunity that probably won't come again very quickly. And while we didn't get the pelican or razorbills we'd been delighted to see last year, another rare winter visitor was around. At least one snowy owl has been reported at Barnegat Light on and off since November, so when another birder reminded us it was there, we couldn't help but take a look. It was seen easily enough from the top of the jetty, though a couple hundred feet away. Sitting calmly in the dunes, among the browned beach grass, the owl looked like a mound of snow that had yet to melt in the relative warmth of the day. He was the third we'd seen that day, after spotting two at Forsythe NWR, and the seventh of the season. With multiple stories already written on Thomas Edison and features on his lab and home in West Orange, it's remarkable that we haven't yet made a proper visit to the town that proudly bears his name. Specifically, I'm talking about the site where he built his first invention factory, the community that led to his famed sobriquet: the Wizard of Menlo Park. The Thomas Edison Center, also known as the Menlo Park Museum, sits modestly on a side street off Route 27, honoring a man whose inventions changed the world. Long-time readers might recall that we've gone there a few times before, notably to find the site of the first electric railroad and get lost in the adjacent woods and trail in what's officially Thomas Edison State Park. The two most notable historic aspects of the park, the museum and the memorial tower, were closed for renovation during those earlier visits. The great news is that while the tower is still mired in the restoration process, the small museum is open again, and better than ever. Housed in what was originally built to be the tower's visitors center, the pre-renovation museum was cramped with enough artifacts to qualify it for the world record for most history per square foot. While it gave a good representation of his work at Menlo Park, there were so many display cases that it was difficult for a tour of more than a handful of people at one time to visit comfortably. 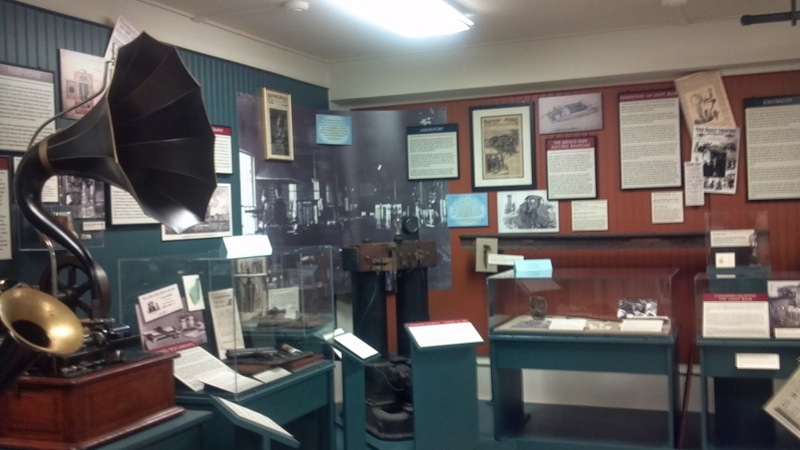 Now, visitors are welcomed with an overview of Edison's work, not just in Menlo Park, but throughout his career. A timeline in the entry area indicates the start of his career as an itinerant telegraph operator and follows him to the East Coast, to Newark, Menlo Park, New York and West Orange. Additional panels illustrate the brief history of Menlo Park as a failed residential development that Edison saw as an ideal setting to build his invention factory. And a corridor into the main display area is lined with copies of a small selection of the 400 patents he was granted for new technologies developed on site. While half of his 1093 patents were derived from work done at the West Orange labs, Edison is best remembered for two Menlo Park inventions: the phonograph and the perfected incandescent light bulb. The newly-curated exhibit gives ample attention to both but also highlights other lesser-known yet still very recognizable innovations. A rusted rail and spike represent the electric railroad he built on the property, while a motorized pen, printers' roller and tube of mimeograph ink introduce the electric duplicating system he invented in Newark and patented in Menlo Park. Another part of the room includes the carbon button microphone Edison developed in 1877 as an improvement to the telephone Alexander Graham Bell had patented a year earlier. Various equipment represent the machine shop where workers made parts that would be assembled into inventions. The best part of a visit to Menlo Park hasn't changed much: the storytelling ability of the Thomas Edison Center's volunteer museum guides. A visitor could definitely learn a lot just by studying the interpretive text around the exhibit, but the volunteers give life to Edison's persistence and belief in the process of invention. Once you've heard the stories and seen the artifacts, you're hungry to explore the places where Edison walked, thought and toiled. Regrettably, very little remains to represent his physical presence on the site, as the lab and other structures were taken down in 1929 and reconstructed at Henry Ford's Greenfield Village in Michigan. If you go to the edge of the Menlo Park property and look carefully atop the rise at the corner of Christie Street and Tower Road, you'll find the sunken foundation of the building that housed the inventor's office, plus another, smaller building. A gnarled, barely-recognizable portion of the doorstep remains, giving visitors the chance to step, literally, where Edison did. The 129-foot high Memorial Tower stands over the actual site where Edison lit the first long-lasting (14 hours) incandescent bulb. A gift from early associates who dubbed themselves the Edison Pioneers, it was constructed of 13 different mosaic mixes of Edison Portland cement, from dark at the base to light at the top, and topped with a 13 foot, 8 inch high Pyrex light bulb. The ongoing restoration includes repair work on the exterior cement and the installation of 21st century lighting and sound systems that Edison surely would have approved of. It's expected to open sometime this summer. The Thomas Edison Center is open from 10 a.m. to 4 p.m. Thursday through Saturday, making it the perfect starting point for an Edison exploration day. It's close enough to the Parkway that you could easily spend an hour or two there and then zip up to Thomas Edison National Historical Park to learn more about his later years. I've driven through enough small towns in the rural reaches of New Jersey to know they can be anything from run-down shells of their former selves to quaint and overly precious scenes out of a Thomas Kinkade painting. After my stop to admire Earl L. Erdner's edge-of-town warehouse-side wit and wisdom during a road trip in November, I wasn't sure what to expect from Woodstown. It's located at the intersection of U.S. 40 and State Route 45, a logical point for commerce, yet in sparsely-populated Salem County, one can make no assumptions. It might be vibrant and well kept... or maybe not so much. Indeed, Woodstown is one of those 'donut-hole' communities, a municipality completely surrounded by its larger neighbor. (Metuchen is another example that comes to mind, surrounded as it is by the much larger Edison.) In Woodstown's case, Pilesgrove's acres and acres of farmland (and the Cowtown Rodeo) are the moat which separate it from the rest of the world. I'd driven around the donut many times in the past, but it never occurred to me to find out what was in the center. I had reason to be hopeful about what I'd find. The WPA Guide to 1930s New Jersey describes the town as having "many old houses, including fine examples of Colonial architecture." 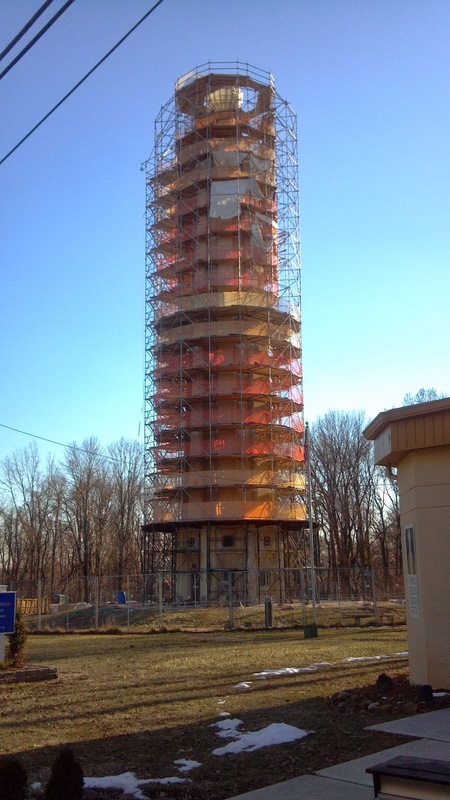 With development pressure far less prevalent in Salem County than it is in Northern New Jersey, I had to believe that few if any of the structures referred to would have been torn down or modified negatively. What I found was a classic, almost frozen-in-time community, in a good way. Route 45 evolved into Main Street, and with it, an exhibit of vintage homes of Federal, Victorian, Italianate and, yes, Colonial style. It reminded me in some ways of a less-traveled Haddonfield, or maybe a more rural but slightly more modern Burlington City. Just a few of the Colonial-era houses in Woodstown. While I could find no markers to note significant past residents or historic events at any of the homes I stopped to admire, I came to realize that the structures themselves are the stars, specifically because they've survived to be appreciated over the years. Each was clearly cared for by its owner, but they're definitely homes, rather than museums. Just past the point where 40 and 45 converge, I came upon the Woodstown Friends Meeting House, built in 1783. Enlarged several times since then, it retains its classic, simple Colonial look, and one could easily imagine parishioners from any era -- late 18th century to early 21st -- entering its doors for meeting. 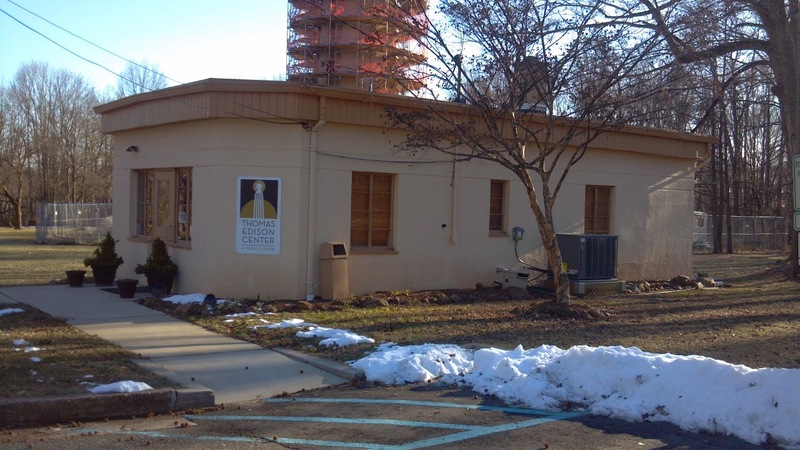 Across the street, a simple yet rambling brick building once held the Friends Infirmary, the community's primary acute healthcare facility before the Elmer and Salem hospitals were built in the 50s and 60s. Though there haven't been overnight patients in the building in some time, its larger purpose remains to be care of those in need: several medical professionals and related agencies have offices there. With evening approaching and a long trip ahead of me, I reluctantly left Woodstown before exploring all of its charms. I'll definitely be back, with the Historic Preservation Commission's helpful map in hand. And hopefully I'll time the trip to get to the Cowtown Flea Market when it's open, too. While Thomas Edison most often is associated with the towns of Menlo Park and West Orange, the prolific inventor experimented in many places around Northern New Jersey. And just as I think I have a good handle on his research projects and where he built facilities, another surprise pops up. One of them is hidden in a 1.4 square mile community on the banks of the Passaic River. Once known as the Beehive of Industry, the Hudson County town of Harrison was long a manufacturing center, home to corporations that capitalized on the proximity to a major railroad line, Port Newark and eventually Newark International Airport. Its narrow streets were conduits for more than 90,000 factory workers who lent their labor to turning out everything from elevators to beer. My own parents were among them for a time, working as technicians at RCA's sprawling vacuum tube division. Many years ago, my dad mentioned that on his way to work he'd once seen evidence of one of Harrison's past industrial residents, the Edison Lamp Company. Workers were digging a trench near the street and had come upon discarded bulbs and scraps of glass tubing that, in Dad's opinion, could only have come from the Edison plant. Indeed, he'd stumbled upon Edison's Harrison location, the largely unknown "second generation" light bulb factory. The first commercially available bulbs had been made in Menlo Park, in the electric pen factory just steps away from where the incandescent technology had been perfected in December 1879. That space, however, proved insufficient to satisfy the impending demand for lighting. Logic dictated that as the Edison company established electric generation and distribution systems in more cities, the market for light bulbs would grow exponentially. Thus, Edison and his team established a manufacturing plant and testing lab at the corner of Harrison's Bergen and South Fifth Streets in 1882, hiring about 150 employees. The testing lab was also relocated to Harrison, further distancing the operation from the company's Menlo Park roots. 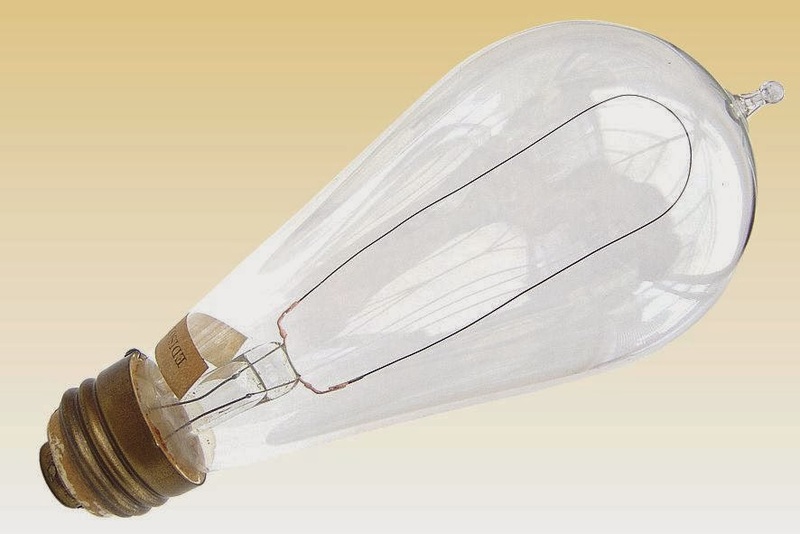 Even though the bulb had been successfully duplicated on a large scale, the Edison team continued to refine and perfect both the product and the manufacturing process. Could they make a longer-lasting filament? Was it possible to increase profits by making the bulbs more efficiently? And what about the lamps the bulbs would burn within? All of these issues, and more, were addressed at the Harrison lab. The Edison Lamp Company merged with several other Edison companies in 1892 to become Edison General Electric Company. Within 20 years more than 4000 people were working at the Harrison plant, turning out hundreds of thousands of light bulbs a year. By that time, however, the business was no longer Edison's concern. A disagreement with his investors had led to his departure from that company, resulting in the General Electric we're familiar with today. The Harrison location kept turning out bulbs until 1929, when its operations were moved to other GE locations. A year later, the Radio Corporation of America (RCA) purchased the property for its radio tube division. Like Edison, RCA both manufactured product at the site and conducted research and development there, ultimately growing its presence to 26 buildings covering 9.5 acres. Little indication of either RCA or Edison Lamp Company exists today, victim to economics and technological advances. Manufacturing in Harrison declined after peaking in the 1940s, and the advent of solid state components spelled the end of RCA's vacuum radio tube division in 1976. The corner of Bergen and Fifth is now taken up by a shopping center, and if any light bulbs are being sold there, they're likely compact fluorescents rather than incandescent. We're having a party! New Jersey turns 350. What gift do you get someone for their 350th birthday? If the someone is the state of New Jersey, it's a yearlong party, which is exactly what's being planned by historic and cultural organizations all around the state. Why now, and why the big deal? On June 24, 1664, the English Duke of York granted the lands that would become our state to Sir George Carteret and John Berkeley, Lord of Stratton. From that simple real estate exchange has evolved an extraordinary place whose people have made countless contributions to every arena of humanity. Throughout the year, organizations around the state will be hosting a variety of events and exhibits celebrating our heritage, with three distinct themes you often see highlighted in Hidden New Jersey stories: Innovation, Diversity and Liberty. We'll continue to emphasize those aspects of our state throughout the year, along with announcements of supporting events, when possible, on our Facebook page. And, as always, we'll look forward to your suggestions and comments. Here's to a great 2014 and a memorable New Jersey 350th!